Fronts & LR – The 7200 Series shock is a large steel body mono-tube (gas) shock. This shock uses CNC machined aluminum internal parts designed for racing with no aftermarket parts. This shock is designed for the racers that are required to use a steel body. This shock contains the latest base valve technology to provide low rod pressure which maximizes traction. The advantage to the low pressure design is for when the racetrack becomes slick and tires lose their grip, the pressure is not increasing. This provides more consistency from the first lap to the last lap by decreasing spring rate build up in your shock. This shock comes with a Schrader valve to fine tune the gas pressure. If your race series will not allow Schrader valves, the shock is available with pressure pre-set and cap in the port hole to make it legal. This is a Non-Adjustable shock. This shock accepts 2 1/2″ & 5″ O.D. Springs and is available in 6″, 7″, 8″ & 9″ shaft lengths. 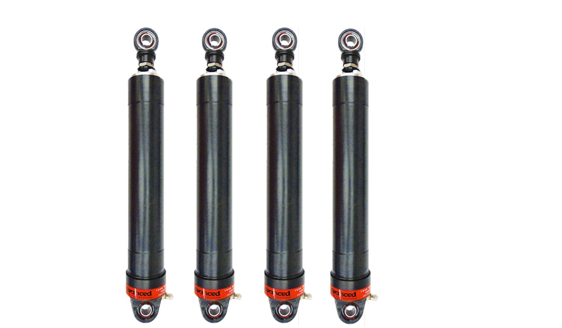 RR – The 7200 Series shock is a large steel body mono-tube (gas) shock. This shock uses CNC machined aluminum internal parts designed for racing with no aftermarket parts. This shock is designed for the racers that are required to use a steel body. This shock contains the latest base valve technology to provide low rod pressure which maximizes traction. The advantage to the low pressure design is for when the racetrack becomes slick and tires lose their grip, the pressure is not increasing. This provides more consistency from the first lap to the last lap by decreasing spring rate build up in your shock. This shock comes with a Schrader valve to fine tune the gas pressure. If your race series will not allow Schrader valves, the shock is available with pressure pre-set and cap in the port hole to make it legal. This is a E-Model Eye Adjustable shock. This shock accepts 2 1/2″ & 5″ O.D. Springs and is available in 6″, 7″, 8″ & 9″ shaft lengths. 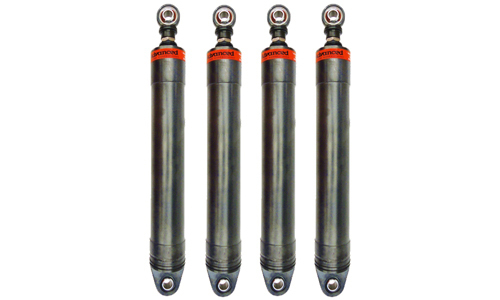 All Four Corners– The 7200 Series shock is a large steel body mono-tube (gas) shock. This shock uses CNC machined aluminum internal parts designed for racing with no aftermarket parts. This shock is designed for the racers that are required to use a steel body. This shock contains the latest base valve technology to provide low rod pressure which maximizes traction. The advantage to the low pressure design is for when the racetrack becomes slick and tires lose their grip, the pressure is not increasing. This provides more consistency from the first lap to the last lap by decreasing spring rate build up in your shock. This shock comes with a Schrader valve to fine tune the gas pressure. If your race series will not allow Schrader valves, the shock is available with pressure pre-set and cap in the port hole to make it legal. This is a Non-Adjustable shock. This shock accepts 2 1/2″ & 5″ O.D. Springs and is available in 6″, 7″, 8″ & 9″ shaft lengths. 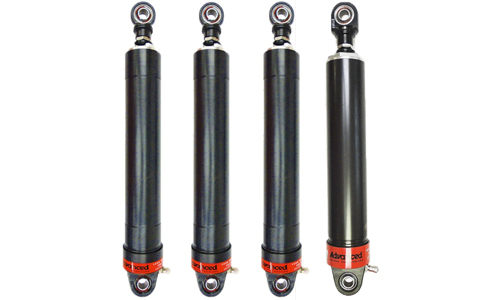 All Four Corners – The 2200 Series shock is a large body twin tube steel shock. This shock uses CNC machined aluminum internal parts designed for racing with no aftermarket parts. This shock was designed to fir the rule of “Steel Body Shock” that saves the racer money. This shock in Non-Adjustable. The smooth body shock will accept a coil-over kit that slides over the body. The large steel body shock accepts 2 1/2″ & 5″ O.D. Springs and is available in 6″, 7″, 8″ & 9″ shaft lengths.